The Torino series by Forno Venetzia offers an authentic Italian wood-fired pizza experience and robust features to meet the demands of entertaining larger gatherings of friends and family. 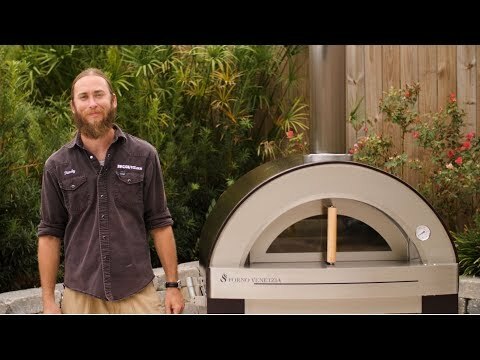 The Italian-designed and engineered Torino 300 freestanding wood-fired pizza oven has a generous 32 x 24-inch cooking surface capable of handling up to 4 pizzas or multiple dishes at once. The fire brick hearth is lined with double-layered ceramic insulation for excellent heat-retention and superior cooking performance. The oven dome features a durable, UV-resistant powder coat finish to help prevent color fading year-round and is complemented by a signature Forno Venetzia chimney cap and oak oven door handle. A thermometer built into the oven face lets you keep track of internal oven temperatures, making it easier to learn how to adjust cooking temperatures using the oven door. A glass oven door window allows you to view food while cooking. The included stainless steel cart features a pull-out side-shelf with stainless steel handle, two cart shelves, a height adjustable tool holder and 4 wheels for portability (2 swivel, 2 fixed). This Torino 500 pizza oven has a red dome finish and is shipped with a fully assembled oven unit, requiring no curing before use. Some cart assembly is required.